It’s been frequently noted that the response effect of twitter is not a simple matter of opening an account and yelling for help; as a new tweeter you get the tree-falling silently effect. That said, I feel overwhelmingly fortunate to put out a single request and get a string of responses. With this, and despite the annoying flitterings of the service, I must admit to my good friend and colleague Scott Leslie, that I’m not quite ready to lead a charge to another ship. And even more warming, is that in the replies to my question today, I only know half of the responders. That’s right, people I don’t know are trying to help me! One pitfall can be squeezing a complex request into 140 characters… i like the thought process of stripping it down to the bare essentials, lose the articles, commas, spelled out “and”s and get clever with abbrvs. My nearly perfect hindsight vision sees now I did not fully explain the need, yet i still got a lot of useful ideas. Here’s the full story. At the NMC Summer Conference recently at Princeton, we had a one day event on the John Lennon Educational Tour Bus, we called Rock Hall 2.0 where we set out 15 minute time slots on our wiki people could reserve to go on the bus and record a sound track, vocal, or anything recordable to be saved as an Apple Sound Loop. The reference to the Rock Hall was referencing the 2006 summer conference in Cleveland, where we had a jam session at the Rock ‘n Roll Hall of Fame — this is the 2.0 version of that, to be cliche. So after a day, we have nearly 50 loops, some guitar, drums, vocals, and more. Some are really good, and then there are ones like mine that managed about 3 guitar chords. Recording a loop is not trivial for someone w/o good timing, because it has to be perfect in 8 beats so it can be repeatable or pitch shifted. The idea is we will make these available, and with software like GarageBand or Logic Studio, people can mix and mash the sounds into original music, and then share it back. Providing the loops is the easy end (we’ll make it a download on our web server), what I was looking for is an ideal online site whern people can post, maybe tag, the creations they make from the loops. And feel compelled to recognize, thank and respond to all! D’Arcy suggested Youtubing it as videos with sound and one photo — interesting approach and would be fine if i were doing them, but am not sure many others would go to that length to publish and post. 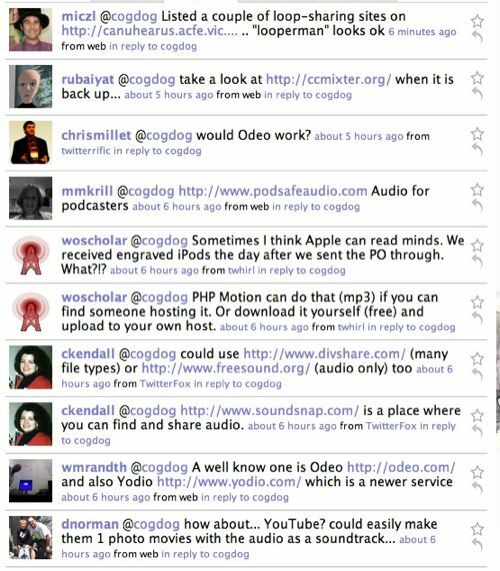 @wmrandth (and a few others) suggested Odeo — wow, its been a few years since I looked (and the site did not come up when I tried a few hours ago) – from what I remember it did have tagging built in, but is it reliable? This person (he/she, tell me to should check the profile lazy blogger) also suggested anew one called Yodio that allows uploading or calling in via phone of audio and publishing with images. It might have the features, but again, is a bit more than sharing audio. But I like the way it sounds, and it is a new candidate for my 50 Ways to tell a story site. @ckendall suggested 3 sites in 2 tweets- Soundsnap, DivShare, and FreeSound – all perhaps viable, but Soundsnao and FreeSound are geared more towards sharing of the loops, not the mixes made of them. Divshare (and others of its ilk) provide the place to upload mixes. A long maybe on that one -but do the files stay there?? @woscholar recommended PHPMotion, an open source software that allows a web site owner to run their own variety of YouTube but handles other media formats. I’ve been toying with trying out the software, but it feels like a sledgehammer of a tool here when I am looking for a smal pair of pliers. @mmkrill pointed at PodSafeAudio certainly is close to being a “YouTube” for mp3s. if it is easy to use and upload, I may take a return peak. A good maybe. Chris Millet was another Odeo suggester. I really did like Odeo in the old days. Maybe. @rubaiyat voted for ccMixter, which was in my thoughts earlier – it sits there to house mixes of other sounds. I’d be strong on it, but need to look more closely to see how simple/complex the uploading is. Lastly (as of 30 minutes ago) miczl, presumably from Australia if i am guessing URLs correctly, provided a whole wiki page of “free” media resources, and yes, looperman looks useful for sharing the loops, but I am still looking for a holding pen for the content created from the loops. Again, I am bowled over that the response, again from folks I hardly or dont know (yet). As if it needs reinforcement, in twitter, and for that matter, most place in the read/write/mix/publish/rant web, you gotta give to get. Well you don’t have to, but it sure helps a lot. I am mulling more over the best way to pull together a collection of audio files created from the loops. No one mentioned my first impulse– my response to almost anything is “tag ’em in del.icio.us”. This would give people the option to get an mp3 on the web through any service where there is a direct link to an mp3, then with a common shared tag, in del.icio.us a tagged MP3 link comes with a free player, so a shared tag would aggregate them. Secondary tags can create a subset, and all the tags come with RSS for free, so the recently tagged audio could be pulled into other sites. And it would not require creating an account at some other site. Have you checked on the relevant audio page of the Web 2.0 Directory – http://tinyurl.com/3o9gcs ? Yes Alan .. i see why you love twitter now. Very useful. Thanks a lot for sharing all the responses .. just what i needed too. I just came across the audio sharing site imeem.com. Nice feature with imeem is that it has an embeddable audio player ala YouTube. Might work for what you want it to do. I haven’t checked out whether they have api’s yet so not sure how truly mashable the audio is. But the embedded player is a nice feature.